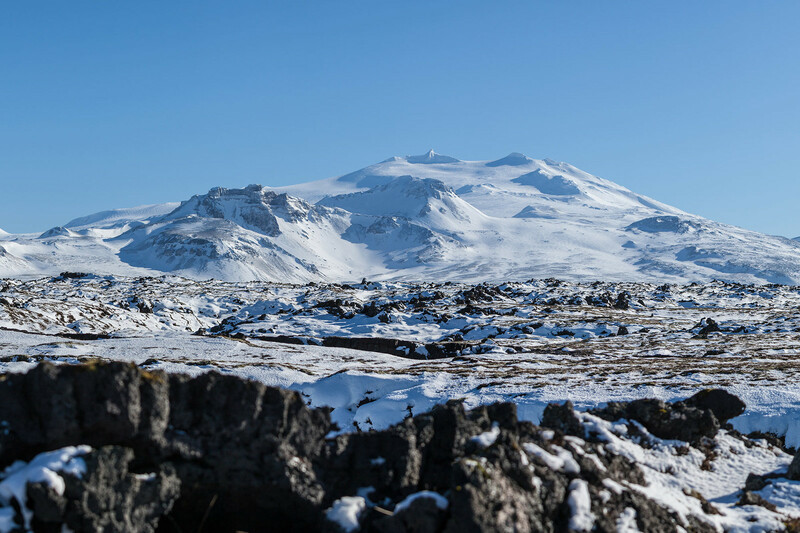 Take on this challenging one day hike to the top of Snæfellsjökull and be handsomely rewarded with stunning views, geological formations and the knowledge that you summited the crowning jewel of the famous Snæfellsness Peninsula. This tour is only available as a private tour. Note: This tour is only available as a private tour. Price is per booking for groups of 1-8 passengers. The Snæfellsjökull glacier is one of the most picturesque glaciers in Iceland. It hides a dormant 700,000-year-old stratovolcano which rises 1.446 m above sea level and it last erupted in 250 AD. Hike to the summit of this glacier in one day and enjoy the surroundings that famously provided the setting for Jules Verne’s classic subterranean epic, “Journey to the Center of the Earth”. This area is rich with history, mystique and charm. Standing on top of the glacial volcano, you will have amazing panoramic views that extend from the Reykjanes Peninsula in the south to the West Fjords in the North. The drive to the starting point of the hike takes you through Snæfellsnes National Park. It is a microcosm of Iceland’s diverse landscape with its black sand beaches, mossy lava fields, rare wildlife, hidden waterfalls and caves. This day tour checks all the boxes: amazing views, geological wonders and a challenging hike which mostly is done on snow covered glacier . We hiked the Snæfellsjökull Glacier with Icelandic Mountain Guides in early June. It was the highlight of our 11-day Iceland adventure. There were only 2 of us on the tour (my partner and me) and neither of us had used crampons or climbed with ropes before. Conditions were challenging because of the weather which was very cold, windy and with very poor visibility. An authentic Iceland experience! Our guide, Villi, was awesome: enthusiastic, knowledgeable, encouraging and meticulous in explaining safety requirements. We felt we were in the best of hands and would highly recommend Icelandic Mountain Guides. I want to hike up Snæfellsjökull but the season is over/not started? How does it work if I want transfer from Reykjavík?